The SuDS treatment train uses a logical sequence of SuDS facilities. This allows run-off to pass through several different SuDS before reaching the receiving watercourse or water bodies. By using the treatment train, run-off will encounter different passive treatment processes that are active in different types of facilities. 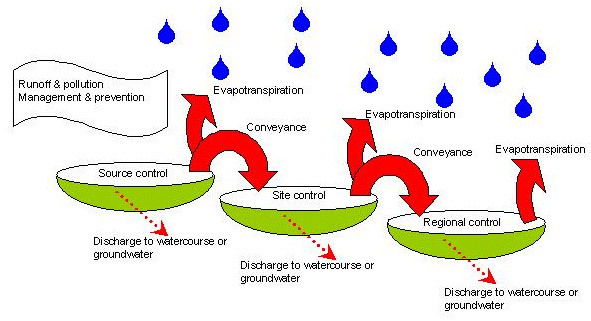 Water is conveyed between each stage by a variety of techniques, such as swales, linear wetlands (which can also provide retention and water quality benefits) or pipes.